I bought this book Beard on Pasta, by James Beard printed 1983 from a 2nd Hand Bookstore when I was at Ithaca, NY, US a couple of weeks ago. I didn't know that James Beard was quite a famous chef till I saw that he had a foundation that gave out awards. Well, I got the book at quite a good deal, sort of, considering that it was pretty old. Here I was, trying his first recipe for basic egg pasta. Well, after I returned, knowing that I was going to make pasta, I bought myself some italian flour - it read Preparato Per Pasta Fresca Fatta in Casa - io Pastaia. I have no idea what this means. I just saw the word pasta and reading the chinese ingredients, it said "hard wheat". I guess that's right. For pasta, it's better to use hard wheat which I read somewhere. Beard didn't specify this in his book though. Add salt into flour, mix well. Make a well in the center of the mound of flour, add in eggs and oil in the well, and slowly stir with a fork to add the flour in. Mix well. Leave it to rest up to 2 hours, minimum 1/2 hour. Mine was about 1 hour. I kneaded the dough, and kneaded it hard. Unlike bread, this really takes a bit more energy, and I kneaded for a full 10-15 minutes, until it was a smooth, firm, pale yellow ball. I let it rest for another 30 minutes. Using a rolling pin, I started to roll the dough flat. 2 rolls and flip and 2 rolls and flip. Always starting from the center. This again takes up quite a bit of energy to roll again and again, till I see the some parts are translucent. I cut the dough into 2 and roll more till I get most part of it translucent. The reason I cut into 2 is because its easier as my table top and rolling pin is just not big enough. With the dough looking very fragile, I gently and slowly folded it in like a swiss roll, and cut it into 1/2 cm width. Unroll each and individual strands, and hang it up to dry. I used 1 chopstick and 1 side on a paper holder, and the other side, my olive oil bottle. As I let it dry, I started preparing the Baked Salmon. Top all ingredients on the salmon, put into the oven cold, baked at 200 degree celsius for 30 minutes. I also cut a tomato into 1/2, put with the Salmon to be baked. Heat up the stove with butter (careful not to brown the butter), fry the garlic and small onions till fragrant, add red pepper and mushrooms and fry, add salt. Turn down the fire and simmer for 10-15 minutes, till soft. Add cream and milk and simmer till thicken a little. To prepare fettucini, boil water, add a little oil. Boil for 3 - 5 minutes, till the dough turns pale, and soft enough to cut with a chopstick. 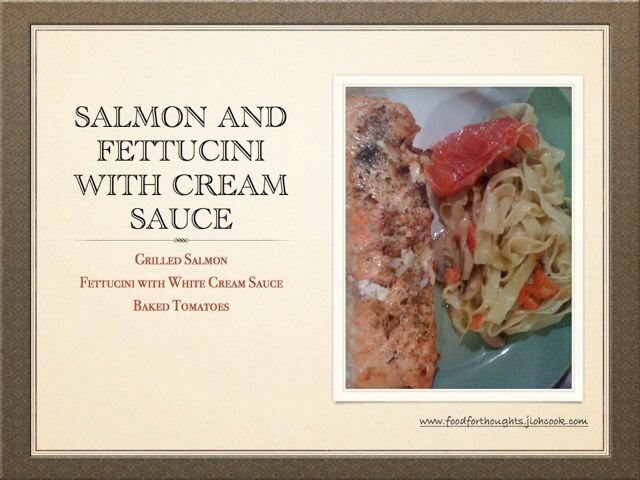 Mix the cream sauce well. By the time all these are ready, the salmon is baked. Place everything on the plate nicely. 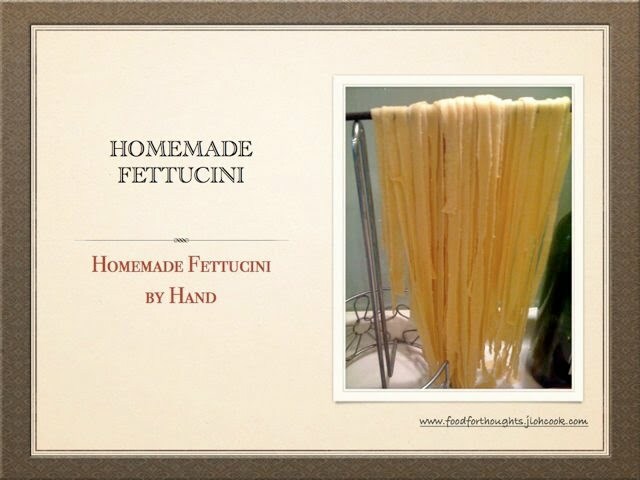 My son had the biggest portion - 100g, both my husband and I had 50g each of the fettucini. My son love it. I love it too. Notice that I didn't mention about my husband, I think he was not impressed. The fettucini was chewy, but not so chewy like rubber - like those dried pasta that you buy off the shelf, that made you feel so bloated after a meal of pasta, it's not like that at all for this homemade version. In fact, it was light, soft and chewy. They would have loved more cream sauce (it was quite fattening considering that I used double cream, so I didn't want to make too much of it). The baked salmon was just baked nicely, crispy on the outside with the garlic baked, a little burnt, and soft on the inside, that melts in your mouth. I felt so good after the dinner, and wished I had made more!